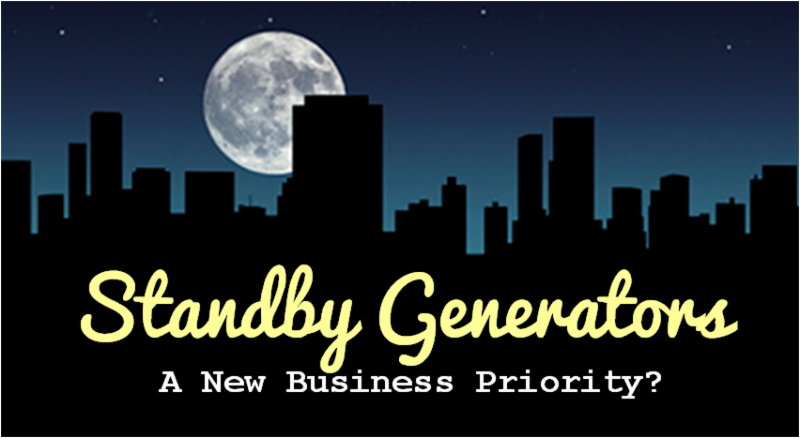 Standby Generators: A New Business Priority? Although standby generators for data centers, hospitals and other locations where power is mission critical have long been mandated by local or state regulations, they have traditionally been less common for other commercial and industrial applications. With continuing outbreak of severe weather disruptions, especially in the northeast U.S., that appears to be changing. Beginning with Superstorm Sandy and continuing with the massive snowstorms we have experienced the past few winters, many enterprises are saying "Enough!". Businesses look at fuel-supply reliability and local environmental codes as primary deciding factors in their choice of backup generators. If you are currently considering an emergency backup generator or trying to persuade senior management that your firm needs one, here are a few points to help you backup the decision. Standby/backup generators increase resale values for every type of property. Power grid failures have increased substantially since 1990; approximately 500,000 energy customers experience a power outage every day. The average cost of a power outage for large businesses and industrial concerns is $90,000 per minute. Companies of all sizes may be able to use standby generators to go off the power grid during periods of peak demand. This approach, called peak shaving, reduces power bills and the cost per kilowatt that the power company charges. Increasingly, utilities offer specialized devices make it possible for enterprises to sell power back to the electric companies automatically. New generators for quality-conscious manufacturers, like Triton Power are more energy efficient and quieter than previous decades' models. In urban areas or where the environment noise is a concern, Super Silent, soundproof enclosures are a viable option. If you company is in the market for a new emergency or backup diesel generator we are here for you! Call us at 305-592-6800 or email info@gopower.com to learn about a Triton Power solution.